Well it's spring break around these parts, and thank goodness because we are inching toward the 90 degree mark folks. Most teachers, students, and families know it's time for some R & R! Whether your family is packing up for a long distance trip or you are having a stay-cation, make some memories. When you return from your journey, allow your children to arrange their items for display. That will give them the opportunity to reflect on their experiences. If they have collected too many items to be placed in the jar, label the zipper top bag with the vacation destination and date. That way you already have an organized location for all the loose odds and ends. 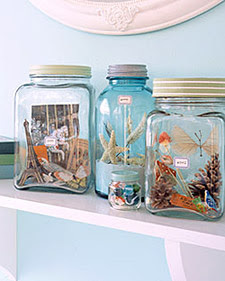 Make sure to put a label or tag on the jar to identify the vacation by. A ribbon trim around the lid is a nice finishing touch. I am a huge advocate of the significance of journaling for all ages. I suggest it to my students time and time again. A road trip is the perfect opportunity for children to write without rules or expectations. Grab a composition notebook and pencil and you are well on your way. If you have a reluctant writer, you might suggest a few things to help them get over the writer's block. * Glue a photograph from your trip in your journal. Write about what you see. Remember to describe the sights, sounds, and smells (you might forget them). * Do a leaf rubbing and write about what surrounded you when you found this piece of nature. * Interview a family member about their highs and lows of the trip so far. * Pretend that you are a travel agent and you have to sell a trip to this vacation location. What persuasive words could you use? * Design your own postcard in your journal. Write a imaginary letter to someone in the future about what this vacation spot was like in 2012. Time away with family and friends exploring the world, or your backyard, is just as valuable if not more at times than the hours spent within the four walls of a classroom. Make the most of it! Enjoy new things, taste new foods, meet new friends, and make new memories! We Caught a Leprechaun...well almost! What does it take to trap a leprechaun? Join us for a hopping good time! They say it's your 100th birthday!